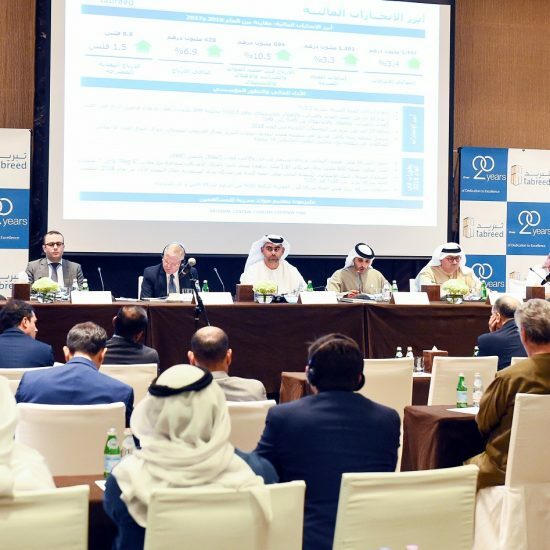 |By Arabian Post Staff|Global trade enabler DP World announced strong financial results for the twelve months ending 31 December 2017. On a reported basis, revenue grew 13.2 percent and adjusted EBITDA increased 9.1 percent with adjusted EBITDA margin of 52.4 percent, delivering profit attributable to owners of the company of $1,209 million, up 7.3 percent, and EPS of 145.6 US cents. On a like-for-like basis, revenue grew 6.0 percent, adjusted EBITDA increased by 8.0 percent with adjusted EBITDA margin of 53.2 percent, and earnings attributable to owners of the Company increased 15.1 percent. 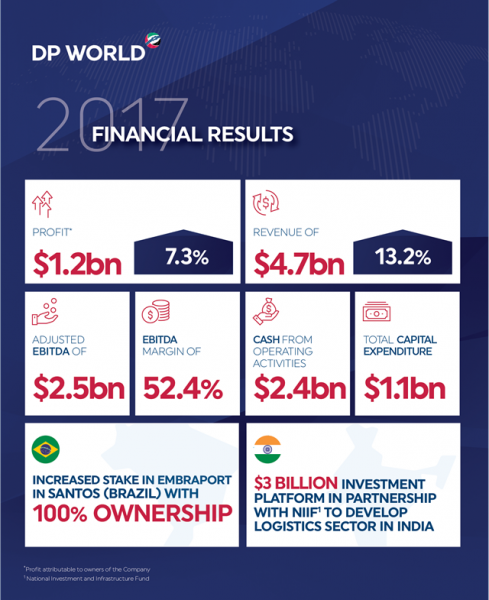 Revenue growth of 13.2 percent was supported by the strong volume growth across all three DP World regions. Like-for-like revenue increased by 6.0 percent driven by a 6.9 percent increase in total containerized revenue. Like-for-like containerized revenue per TEU (twenty-foot equivalent unit) grew 0.7 percent and total revenue per TEU remained broadly flat (-0.2 percent). Adjusted EBITDA grew 9.1 percent and achieved an EBITDA margin for the full year of 52.4 percent. Like-for-like adjusted EBITDA margin was at 53.2 percent. Strong adjusted EBITDA growth resulted in a 7.3 percent increase in profit attributable to owners of the Company before separately disclosed items on a reported basis and 15.1 percent growth on a like-for-like basis at constant currency. Cash from operating activities increased to $2,412 million up from $2,002 million in 2016.Free cash flow (post cash tax maintenance capital expenditure and pre-dividends) amounted to $2,095 million against $1,674 million in 2016. Leverage (Net Debt to adjusted EBITDA) decreased to 2.5 times from 2.8 times in 2016. 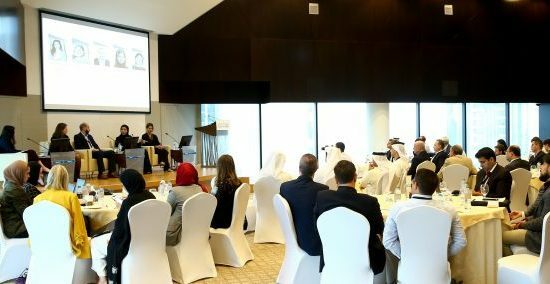 DP World was upgraded again by rating agency Fitch to BBB+ from BBB with stable outlook following the one notch upgrade in 2016.